base price: $0.59 / Stk. Anodized aluminium allen bolts, great for bodywork parts. Available in 4 colours (blue, red, gold and orange anodized), 5 lengths (20, 25, 30, 45 and 50mm) and 3 thread sizes (M5, M6 and M8). 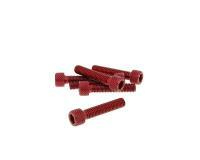 Set of 6 supplied, 30mm, red anodized, M6 thread. Note: Do not use on weight-bearing bodywork or brake parts. Decorative use only and lower quality than standard steel bolts. Give your scooter some flare by changing the standard screws to anodized aluminum!